My kids love walking to the mailbox for one reason. It comes in the form of a brightly colored magazine called Clubhouse Jr. Within the pages are stories, life lessons, jokes and activities. They pour over every amazing detail together on the couch and then inevitably have some craft request from within. I am decidedly un-crafty. 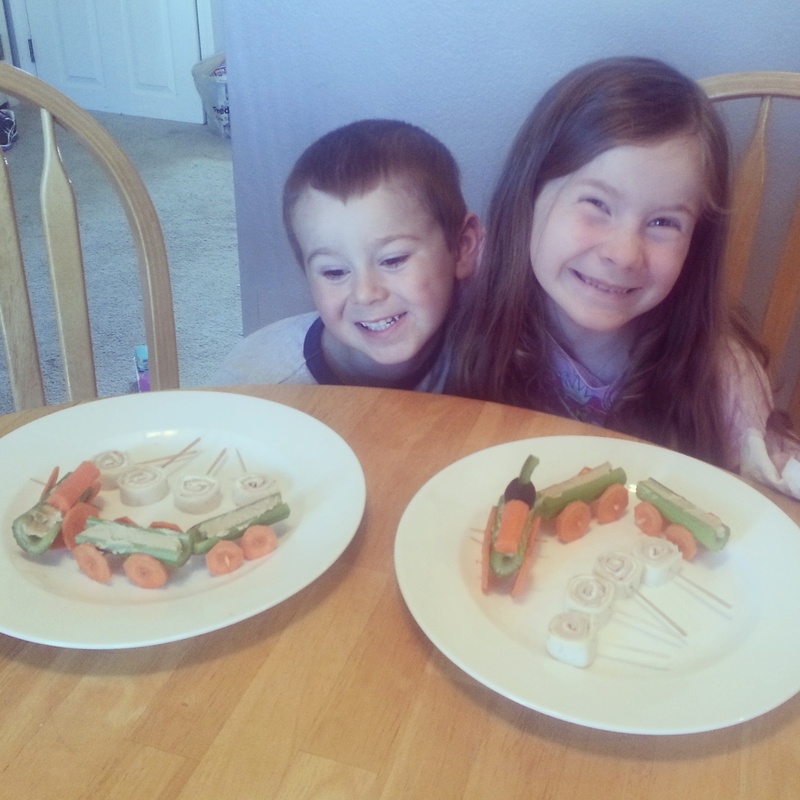 This month, the “craft” they were interested in was a fun food activity. Whew. Food crafty-ness I can handle. 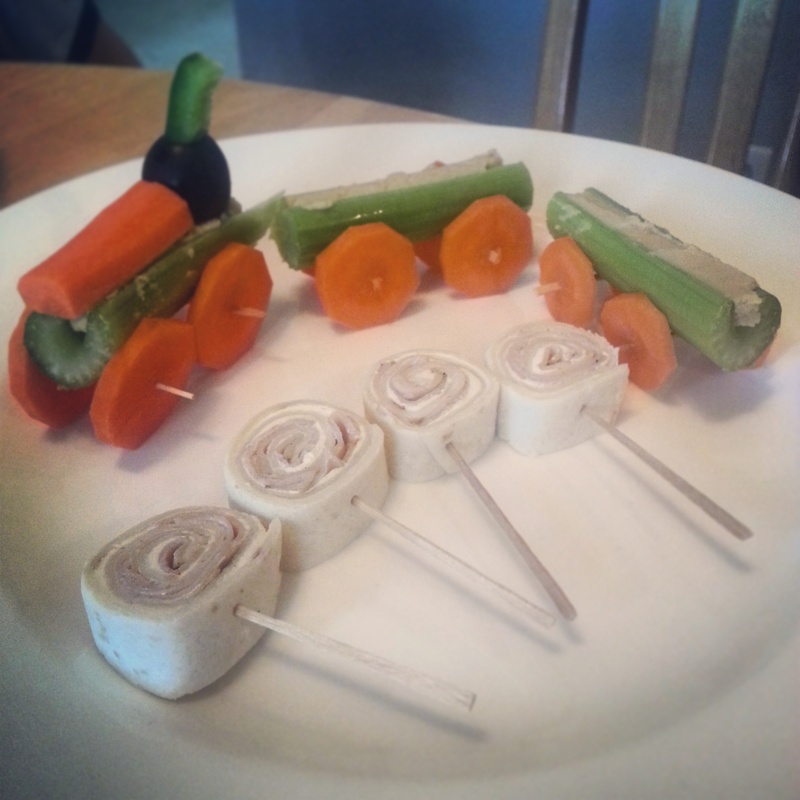 If you are looking to make vegetables incredibly delightful for your kids, or simply enjoy throwing some fun into lunchtime, try out these veggie train and lunchtime lollipop recipes, courtesy of Clubhouse Jr. I went with the hummus version for the trains and added an olive for my smokestack on the engine. You can fill those little celery cars with peanut butter, cream cheese or whatever your kids love instead. And I’m sure there are much more creative veggie toppers than I used. Let your (or your kid’s) imagination run wild! My kids have officially reached the “awkward-never-a-good-picture” age. Notice my son’s olive engine is already gone. He loves olives with the passion of a thousand suns. Cut celery into 2 1/2 inch stalks. Spread one teaspoon of cream cheese, hummus or peanut butter in each stalk. Cut a carrot into circles about 1/4 inch thick to make the wheels. Push a toothpick into the center of a carrot wheel. Add a wheel to the other end. Repeat to make 2 sets of wheels. On a plate, arrange the wheels 1 1/2 inches apart. Place the filled celery between the wheels to rest on the toothpicks. Repeat as neccessary for more train cars. Place an olive (or cherry tomato) with a piece of green pepper (or broccoli) in the top on the front of on of the cars for an engine stack. Add a piece of carrot (or a baby carrot) for the engine body. If desired, load your train cars with raisins, craisins, peas, broccoli or nuts. 1. Spread thin layer of cream cheese on tortilla. 2. Cover tortilla with lunch meat. 3. Add lettuce, if desired. 4. Roll up tortilla tightly. 5. Poke in toothpicks, 1 inch apart. 6. Cut between toothpicks to make 1-inch pieces. If desired, slip a 2-inch piece of straw over the toothpick. Wrap each lollipop in a 5-inch square of plastic wrap. Tie with curling ribbon at the top of the toothpick stick. Gobble-Berry Lollipops: Fill tortilla with cream cheese, cranberry sauce and sliced turkey. BLT Lollipops: Fill tortillas with herb cream cheese, bacon bits, thinly sliced tomato and lettuce. Eat right away—tomatoes can make the lollipops soggy. Rainbow Fruit Lollipops: Fill tortilla with cream cheese and fruit leather or jam. Make several lollipops, using a rainbow of colors. Pizza Pops: Fill tortilla with cream cheese, pepperoni, mozzarella and sliced black olives (optional). Dip in tomato sauce. Sunny Hawaiian Lollipops: Mix 2 tablespoons of cream cheese with 1 tablespoon of well-drained, crushed pineapple. Fill tortilla with cream cheese mixture, shredded carrot and a thin layer of ham.